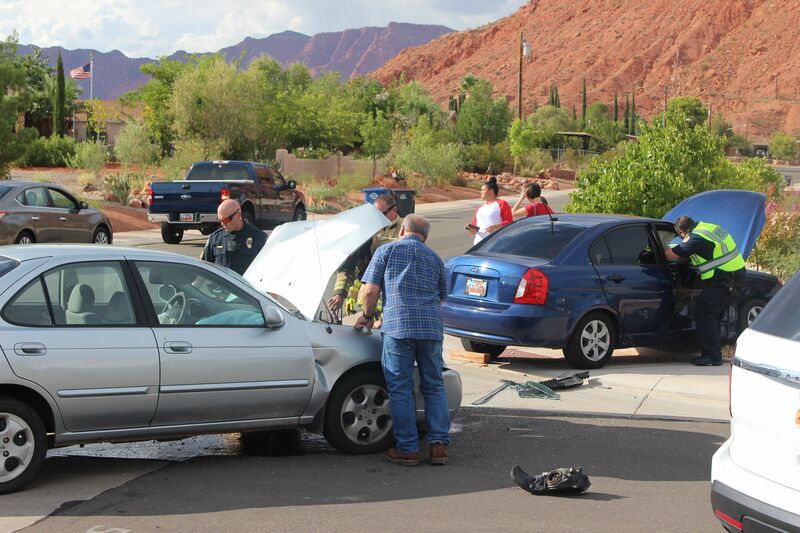 IVINS — A woman was transported to the hospital Monday and her children were released to their grandparents following a collision at an Ivins intersection. At approximately 5:20 p.m., the woman was driving a blue Hyundai east on 200 North when she failed to yield the right-of-way to the driver of a silver Nissan traveling north on Main Street, Santa Clara-Ivins City Police Sgt. Nick Nuccitelli said. The Nissan smashed into the passenger door of the Hyundai. The impact of the collision forced the Hyundai up onto a nearby sidewalk. The woman driving the Hyundai was transported to Dixie Regional Medical Center in St. George after complaining of back pain, Nuccitelli said. The woman had two children with her who were checked out by medical personnel on scene before being released to their grandparents. The driver of the Nissan sustained no reported injuries, Nuccitelli said. Airbags deployed in both vehicles, all occupants were wearing seat belts and the children in the Hyundai were properly restrained, Nuccitelli said. Both cars were severely damaged as a result of the crash and had to be towed from the scene. Nuccitelli said the driver of the Hyundai would likely be issued a citation for failure to yield. Santa Clara-Ivins Police and Ivins Fire and Rescue responded to the wreck.